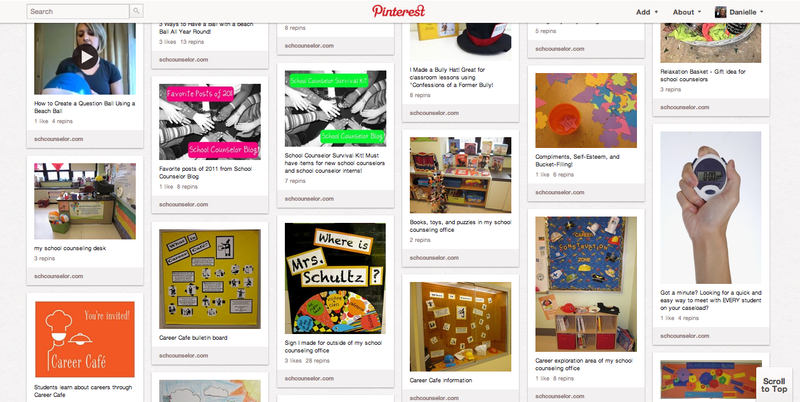 School Counselor Blog: Pining Over Pinterest! Some of you may know about Pinterest already... and maybe you are as addicted as I am... but did you know you can use Pinterest as a school counselor to find, organize, and share ideas?! The best way to describe Pinterest is a virtual cork-board where you can keep track of all of the cool ideas and inspiration you find. Pinterest allows you to organize your inspiration by "pinning" things you like on to boards you create. Pinterest is currently invite only, but it only take a day or two to get an account once you request an invite! "pin it button" for your web browser that allows you to "pin" to your Pinterest boards! There are many things I love about Pinterest. It is very visual. I love seeing pictures of ideas. Just looking through pictures can be inspirational. Even if the item isn't about School Counseling I am sometimes inspired! I also love that most "pins" are not just pictures. Many pins will take you to the original website including a description of the idea, a how to, or a post of some kind. Tabitha also mentioned a Beginners Guide to Pinterest from Mashable in her post if you are still feeling lost! I have been working on "pinning" all of my posts from School Counselor Blog onto a School Counselor Blog Board. Here is a screen shot below of what a board looks like. You can also pick specific boards to follow or just re-pin certain items you find interesting. By pinning my posts, you not only get to see the picture, but you will be linked back to the original post when you click on it. I love the idea of doing something like this for "No Name Calling Week." This mural is just awesome! I would love to do something like this at my school. I especially love that it is hands! I am loving using Pinterest to keep track of ideas both personally and professionally! For more ideas and inspiration follow my Pinterest boards! Are you on Pinterest? How are you using Pinterest as a School Counselor? What cool ideas have you found? Love it Danielle! Thank you for mentioning me...and making me feel better about being slightly, ahem, obsessed with Pinterest. I am glad I am not the only one! I just joined pintrest and am a little lost. Thanks for linking info about it! Can't wait to start collecting ideas! Tabitha you are in good company because I am soooo hooked! How are SCHOOL COUNSELORS like LEGOS?